Welcome back! So much has happened since our last Sunday School lesson. Our children have seen Lent blossom into Easter. The move from Lent to Easter was filled with the activities of Lent and Holy Week. Since these are rich times in our Parish, we will take the next week of Sunday School to reflect on some of these events and symbols–Palm Sunday, the cross, Holy Thursday (with footwashing and the institution of the Eucharist), Good Friday, the tomb, the vigil, resurrection on Easter morning (at least the first day of the 50 days of Easter). Below you will find the program overview for Christian Education during Lent, Holy Week, and the first day of Easter. The lesson next week will be a day for reflection. I will post some light activities, but it will be helpful to have seen this recap as you ask your students what they notice and remember from the Lenten season and the events of Holy Week (in the liturgy or in the story). 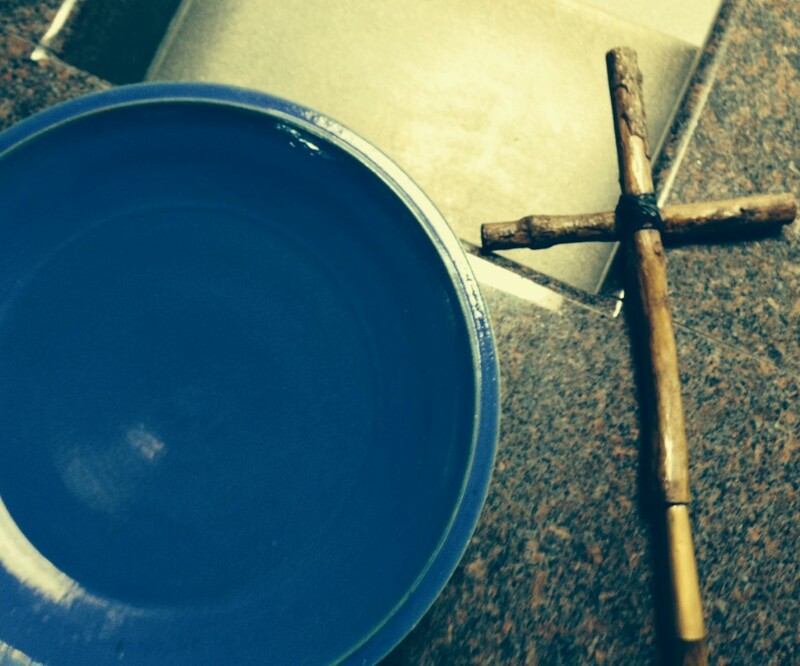 During Lent many of our children participated in a Lenten Series on Wednesday evenings. The first week, we talked about the Good Shepherd and painted crosses with images of the sheep and Good Shepherd. Some of the children re-told the story of the Good Shepherd using pom-pom sheep and crosses. The children learned that the Good Shepherd knows each one of the sheep by name. Together we named the sheep several times before I went around the circle pointing to each sheep and lovingly bestowing upon it the name of each child in the circle. We learned that the love for each sheep is so deep that the Good Shepherd even lays down his life for the sheep. Our third week together, we talked about the Church’s Lenten practice of almsgiving. The story of the widow who gave all she had to the temple treasury was our starting point. The children painted boxes in which they might collect coins for the poor. Next, we learned of Jesus’ prayer in the Garden of Gethsemane and made Anglican prayer beads that we might join Christ’s own prayers with ours. Many of the children wrote and created small prayers to use with their beads. During our last week together we stayed in the Garden, focusing on Jesus’ praying while his disciples kept watch. Our conversation focused on the disciples waiting with Jesus and how they fell asleep because they were tired and scared. We remembered that we too are eagerly waiting with the disciples, waiting to see what happens next, waiting for the return of Christ. The Easter vigil, we decided, was one such time–we wait for Jesus to raise on the morning of the eighth day and we await Christ’s coming again in final victory. On this day we decorated Paschal candles with signs of the cross, Christ, victory, and resurrection. As you well know, our Sunday School classes have been bustling and busy during the Lenten season. Many of our classes chose a discipline (bringing in food for a food pantry, learning the books of the Bible, going over the stations of the Cross) to work through during Lent. At music we almost always sang the Jesus Prayer song. All of our classes heard the Godly Play story of the Good Shepherd and World Communion, a lesson which helped our children see that God calls all people to the table prepared by Christ. We meet Christ, our Good Shepherd, at the table again and again when we share the Eucharist together. In the next weeks, as we focus on some of the resurrection appearances, we will see some of these themes again–Jesus is known, remembered, and met at the table and in the food we share together just as Christ was known to his disciples at the table and in the breaking of the bread. Our Sunday School lessons focused on the images of and relationship between the Good shepherd and the sheep through exploring the Parables of the Good Shepherd and the Lost Sheep. We played sheep games, retold the story from many different perspectives, found lost “sheep,” named sheep, read books, and asked some of the following questions: What does it mean that Jesus says he is the Good Shepherd? What does this image tell us about God? What does it tell us about the cross? And, what does this tell us about who Christ is for us? We closed our Sunday School weeks out by talking about the story of the Last Supper, a story linked to the Good Shepherd stories through our Godly Play lesson. Many of our children began Holy Week with the Palm Sunday Intergenerational Event. They heard of Jesus’ ride into Jerusalem, and waved palms in a processional with their families during one of the liturgies. Then, they folded palms into crosses so that they might see the symbol of Jesus death all week. On this day, the children also walked an interactive version of the Stations of the Cross where they encountered images of Christ’s journey and objects that helped them explore the story in a tactile way. Throughout the week, many of our children attended Holy Week services with their families–Holy Thursday’s foot washing and Eucharist, Good Friday’s somber service. Many of our younger children made simple Holy Week crafts in the nursery. The Holy Week services culminated in the Easter vigil which went late into the night. The children witnessed the lighting of the new fire and the Paschal candle, baptisms, confirmations and receptions, and shared in the Eucharist. Easter morning was all about fun and celebration–we said Alleluia!, unwrapped our alleluia banner, and sang the words of celebration to our heart’s content. Then, Holy Family’s children went on an egg hunt.